The devastation began in December when Storm Desmond hit the North of England. At Allen Banks the suspension bridge, which had just been rebuilt after being damaged by a storm in 2013, was badly hit and much of it was washed away. The whole area is thought to be unstable and movement in the land is being seen daily. Rangers are constantly assessing the land and you can keep up to date with any progress via Facebook and twitter. 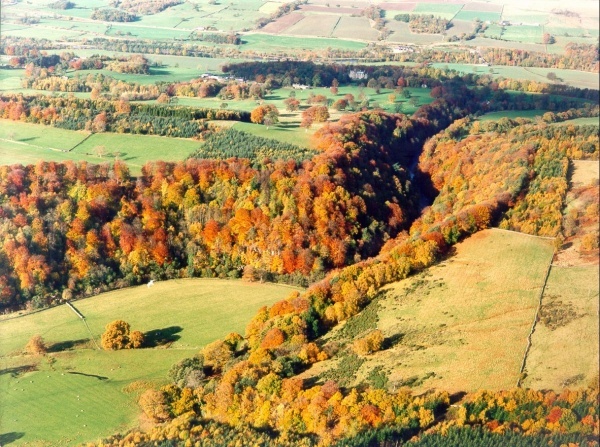 This extensive woodland area of gorge and river scenery, including the 41-hectare (101-acre) Site of Special Scientific Interest (SSSI), has miles of waymarked walks through ornamental and ancient woods. Largely created by Susan Davidson, Allen Banks has become a fantastic home for nature such as flora, fauna and fungi. It is also well known for its carpet of bluebells and ramsons, commonly known as wild garlic, which covers the woodland floor in spring and early summer. There's the remains of a medieval pele tower and a reconstructed Victorian summerhouse and ornamental pond during the wonderful woodland walks. 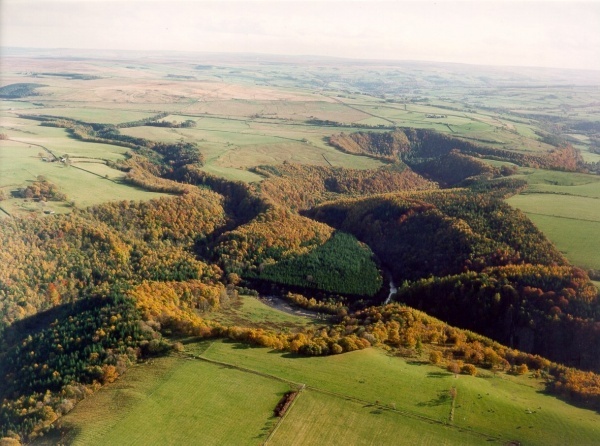 There are also over 70 species of birds that have been spotted at Allen Banks and a number of mammals such as roe deer, dormice, otters and bats. We left the car (free parking for National Trust members) and started to follow brown route - until we reached the farm and then took green route - back to the farm and brown route again to go back to parking (the other site of the river). It was 10km in total. What a beautiful walk! I have to admit I was expecting flat easy route but, especially green route, is quiet hilly and challenging. Quiet muddy in the parts you wouldn’t expect it to be. I was so glad I took trekking shoes, bottle of water and couple of snacks! Despite the rain it was a very enjoyable walk, with some stunning views. Some of the signage for the different walks are missing however that does not detract from how easy it complete a circular walk. As National Trust members the car park is free when you scan your membership card, but don't know the cost if a none member. Our first visit here, although my wife had been when she was a child. A family of 4 with 2 young boys and they loved it. We walked a good few miles along the river paths and then down to the water. A lovely place to visit and to get away from things. Toilets are on site and are clean but no food facilities are present so remember to take a picnic. One word of note is that the pathways are not flat and steps are steep so not suited to those with mobility issues. Lovely walk with the family. 5 Kids and 2 Adults, we loved it. The kids played in the water and we had a long walk and picnic. Defo will return. First visit to Allen Banks for a couple of years - and nothing has changed. There is no suspension bridge, nor any sign of any plans for one. The walk on the west bank is still closed, with no sign of any progress being made. You won't find any news online regarding progress either; the blog was last updated a year ago. The only thing which is bang up to date is the car park ticket machine. Has the National Trust given up on Allen Banks like it has on Stephenson's Cottage? Does it see the future only in mass audience, paid-for fun factories like Gibside, Wallington and Cragside? Are local National Trust Members getting value for money? There may be legitimate answers to these questions, but at a time when communications have never been easier, the online and on-site silence is odd.